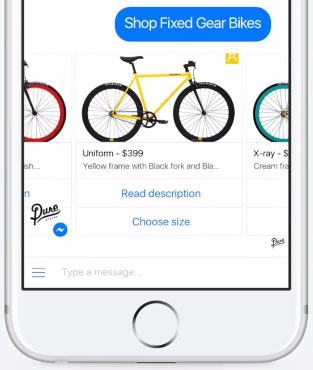 Shopify clients who use Facebook Messenger to reach out to customers will be happy to know they can now use the popular instant messaging app to facilitate purchases too. Starting this month, the company’s Messenger channel can be used to not only notify customers regarding their orders and respond to concerns, but sell merchandise as well. Though online channels remain critical to the retail industry, there is also a growing awareness that the tide of eulogies for bricks-and-mortar a few years ago were premature, and that incorporating a human element is important too: though customers are more likely to shop at app-friendly retailers, it’s proven equally important for online retailers to have a physical presence. 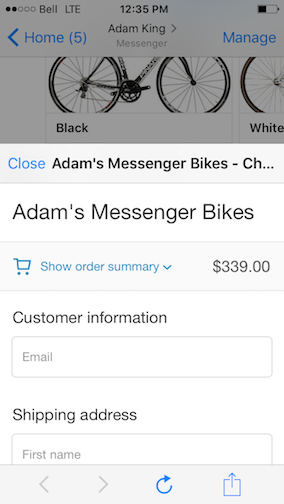 On the customer-facing side, Shopify’s Messenger support simply adds a “Shop Now” tab (right) to conversations, which customers can tap to view a Shopify client’s product catalogue using a carousel interface similar to Facebook’s Canvas platform. …They can buy it with a few more taps using Shopify’s checkout interface (further below). The Messenger sales channel is free for all Shopify clients – all they need do is add the Messenger channel in Shopify, connect their Facebook business page to the platform, and choose the products they would like to sell through Messenger. You can find out more about Shopify’s Messenger platform here.